With their inventive approach of sampling retro public information films, archive footage and war time propaganda materials atop euphoric soundscapes of electronic rock, London-based history fetishists Public Service Broadcasting can lay claim to being one of music’s most unique acts. While 2013 debut Inform – Educate – Entertain was so effective in evoking such nostalgic themes as 1940s fashions, Spitfires and late 50s road safety, one couldn’t help wondering what, if anything at all, could possibly come next? February release The Race for Space revealed that they would be tackling the Cold War race between USA and Russia for spaceflight supremacy. Taking inspiration from the Soviet launch of the first artificial Earth satellite, opening track ‘Sputnik’ is a gradual, bass heavy build-up of subtle guitar loops and humming synths as we hear the archived narration “This is the beginning of a new era for mankind”. However, it takes a track inspired by rather more surface-dwelling vehicles to launch the evening skywards; the purposeful Rickenbacker thrash of ‘Signal 30’ bristles with intent as the dual big screen monitors emanate hazardous road traffic chaos and the warning “No drinking and driving – not even beer, not even water”. The band’s 2015 tour includes the addition of a new presence on stage and we are introduced to J.F Abraham who ably fortifies the sound with a versatile musicianship that sees him adding bass, guitar, synths and flugelhorn. While the offloading of almost the entire musical burden from the shoulders of J.Willgoose Esq. is almost disappointing (watching his busy, mad professor displays of musicianship has always been a joy of live performances past), the new bandmate’s contributions make for an increased potency of sound. Nonetheless, the role of the tweed-suited Willgoose remains one of frenetic activity. With his wide-ranging deck of samples, loop pedals and laptop effects, along with his alternating between guitar, banjo and synthesiser, he retains his aura of active virtuosity; the banjo-led ‘Theme from PSB’ sees him tap away relentlessly at a multitude of voice samples while ‘The Now Generation’ observes him expertly riffing away at his guitar with one hand while laying down a keyboard figure with the other. It’s a night where the old songs outshine the new; the tracks from The Race for Space often feel a little sparse in their serving as subtle soundscapes to facilitate the archived commentaries. The new material, however, does have its interesting moments; ‘E.V.A’ features some pleasingly funky guitar riffing while ‘The Other Side’ effectively brings fourth the suspense of the Apollo 8 mission losing contact with Houston before waking up in a gale of surging synthesisers at the re-emergence of Jim Lovell’s voice. Furthermore, ‘Go!’ includes some tasty guitar and a catchy keyboard figure while the excellent jazz funk of ‘Gagarin’, complete with a three piece brass section and dancing spaceman, sits amongst the band’s best work. The new space theme is successful in that it gives different shade to the group’s hitherto mostly British flavoured nostalgia and naturally it delivers the scope for the band’s visuals specialist Mr B to work with the impressive images of space exploration. Certainly, it is a relief that the band have dispensed with their ill-advised past excursion into ice-skating themed tracks narrated in Dutch. All being said, it’s the more familiar songs that deliver the performance’s most riveting moments; combined with footage of Britain on the eve of battle, ‘If War Should Come’ utilises eerie, doom-laden synths and Neville Chamberlain’s official declaration of war to spine-tingling effect; elsewhere the driving rock of ‘Spitfire’, featuring more ambidextrous musicianship from Willgoose, is a tour de force of irresistible energy. Tonight’s sold out show is testament to the fact that Public Service Broadcasting have transcended the novelty of their uniqueness and evidently are now a much sought after live act. The marrying of music, visuals and archived commentary see that their live shows will never be devoid of entertainment. As before, the question remains: what next for Public Service Broadcasting? 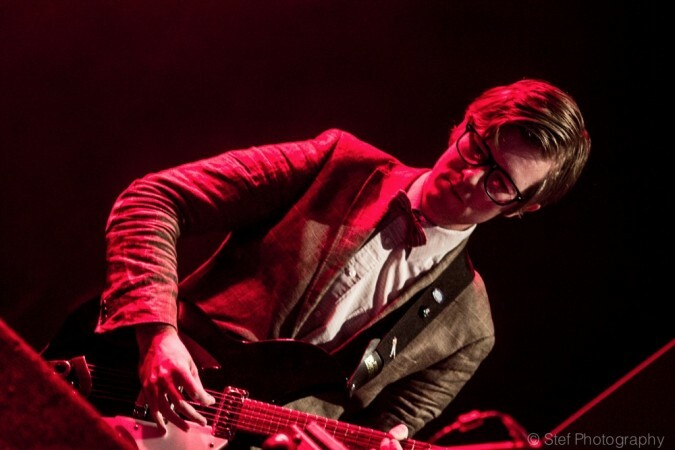 Tagged O2 academy, public service broadcasting, review, scott hammond. Bookmark the permalink.